Here you go, folks! THIS is the evidence the Pentagon used to justify an attack on a sovereign nation. It is a map, showing a flight plan. That’s it! They then used this shaky evidence to assign intent and convince President Trump to bomb Assad. THAT is not enough evidence to justify bombing the crap out of an ally, and yes, Assad was an ally (emphasis on “was”). Our mission in his country was the same as his, to destroy the terrorists. We were never invited, by the way. Assad had a healthy distrust stuck in his craw from his experience with Barack Hussein. The reason that this is not enough evidence is both Assad and Putin explained the situation. It was collateral damage, plain and simple. The US has killed thousands of noncombatants in similar ways. 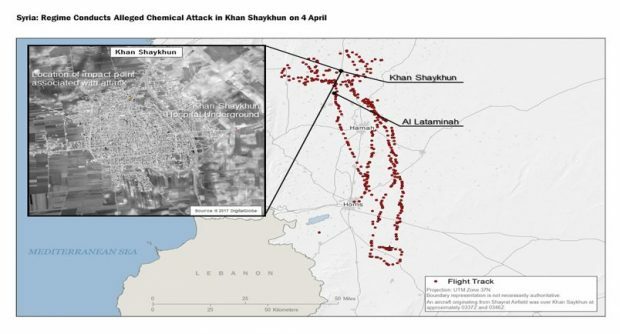 Assad’s forces had bombed a terrorist munitions dump which happened to contain canisters of Sarin and/or Sarin bombs, which when exploded released Sarin into the local atmosphere. Perfectly plausible explanation, and based upon all available evidence, I believe it. Terrorists, posing as Syrian citizens, may very well have set this up, planting the munitions, then reporting a known terrorist munitions dump at the location Assad bombed. Nah, they wouldn’t do that, would they? I still love President Trump. Nothing has changed there. I have been with him for two years, from the beginning, and I will not abandon him. I donated a lot of time, money, and bandwidth helping him get elected. I just think he made a rookie mistake, reacting hastily on not enough evidence. No problem. He’s human. I hope he is humble enough (unlike Barack Hussein) to admit fault, compensate Assad for a few planes, and move on. Assad can become a valuable ally. The Pentagon released a map Thursday that reportedly shows the flight pattern of a Syrian aircraft that dropped chemical weapons on civilians Tuesday, according to The Daily Caller. The map was released hours after President Donald Trump ordered the U.S. military to fire 59 Tomahawk missiles at a northern Syrian airbase, in retaliation for Syrian President Bashar al-Assad’s attack. “We have a very high level of confidence that the attacks were carried out by aircraft under the direction of the Bashar al-Assad regime, and we also have very high confidence that the attacks involved the use of sarin nerve gas,” U.S. Secretary of State Rex Tillerson told reporters Thursday. McMaster clarified that the strike will not cripple Assad’s ability to use chemical weapons and is instead is meant to send a deterrent message. “The regime will maintain the certain capacity to commit mass murder with chemical weapons, we think, beyond this particular airfield. But it was aimed at this particular airfield for a reason, because we could trace this murderous attack back to that facility,” he continued.